Culinary campers will spend each morning in our Culinary Studios and immerse themselves into the cooking activity of the day. Our daily content is designed to teach campers new recipes as well as introduce them to new techniques, tools, and ingredients. Campers will work in teams to strengthen the overall group, teach delegation and collaboration skills, and build deep camp friendships. Berkshire Hills Culinary offers two afternoon electives every day. 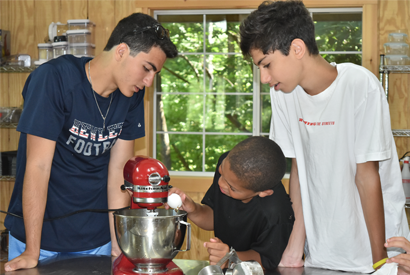 During one elective, campers will choose from one of the many non-culinary activities that Berkshire Hills has to offer. During the second elective period, a different daily culinary elective will be offered. Culinary Campers can head back to the Culinary Studio for this elective or continue to explore other activities with friends. Activities never stop at Berkshire Hills. 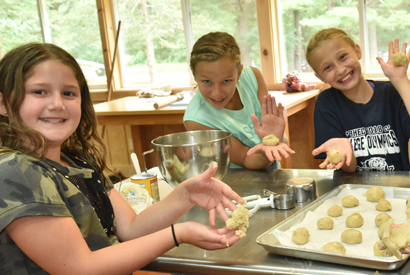 Evenings are a mix of all camp, unit and culinary specific programs. Watching a camp show, cooking over a fire on an overnight at the camp treehouse, competing in a Lip Sync contest or a game show are just a few of the fun activities your child might enjoy after dinner.